This video is an overview of the Hoover Power Scrub Deluxe Carpet Washer FH50150. It shows users what the main features of the carpet cleaner are, and locations of various parts and switches used in operating the machine. It sounds like a mouth-full, but it’s actually quite simple. There are notes to the video below in case you need a quick recap. The Hoover Carpet Basics Power Scrub cleaner comes with a good combination of features that makes it an outstanding package. If you are considering getting a good carpet cleaner, this is a good video to check out. Video Synopsis: Demonstration of the features on the Hoover Power Scrub, such as the solution trigger, the well-positioned carry handle and where the wash-rinse selector. The video also explains the different parts of the machine, going into details like where the hose connection port, solution connection port (using tools & attachments), as well as where the foot-operated handle release and foot-operated on-off switch are located. 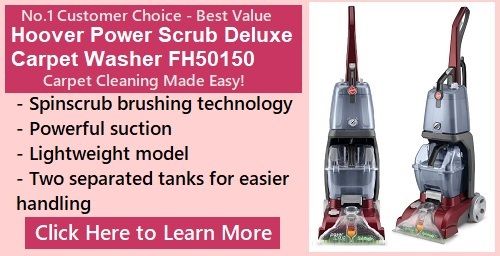 To learn more about the Hoover Power Scrub Deluxe Carpet Washer FH50150, see the Full Review on it.